New studies have shown that fish is among the best foods that a pregnant and breastfeeding mom needs to take for the benefit of her baby and her own. However, some other studies raised questions about fish consumption, citing that some fish could actually have an adverse impact on the brain development of a baby. According to the latest research by the U.S. Food and Drug Administration (FDA), fish is good and eating large amounts of it is even better. There are numerous advantages in the consumption of fish, according to the FDA study. The federal agency recommended fish for permanent women and breastfeeding mothers. One of the many benefits of fish in the diet is that it promotes proper fetal brain development during pregnancy. The benefits continue in the baby even after birth so that they have a healthier life throughout. Fish is rich in Omega-3 fatty acids, which are crucial for the proper development of the nervous system and the brain. Pregnant women who consume large amounts of fish also stand to benefit from lowered risks of preterm birth and low birth weight, among others. Stephen Ostroff M.D, FDA’s acting chief scientist, stated in statement that women who avoid taking fish during pregnancy deny their babies important nutrients. FDA is not the first federal agency to recommend fish diet for pregnant and breastfeeding mothers. The U.S. Environmental Protection Agency (EPA), has in the past recommend consumption of fish. The agency recommended maximum fish consumption, citing that the minimum amount should be two or three fish servings per week. Those concerned about the nutritional risks of consuming fish in pregnancy have often cited that some fish contained mercury and other chemicals. They cite that such chemicals can pose serious risks to brain development in babies. However, FDA, the agency that approvals drugs for marketing in the U.S., says there is no risk in fish consumption. 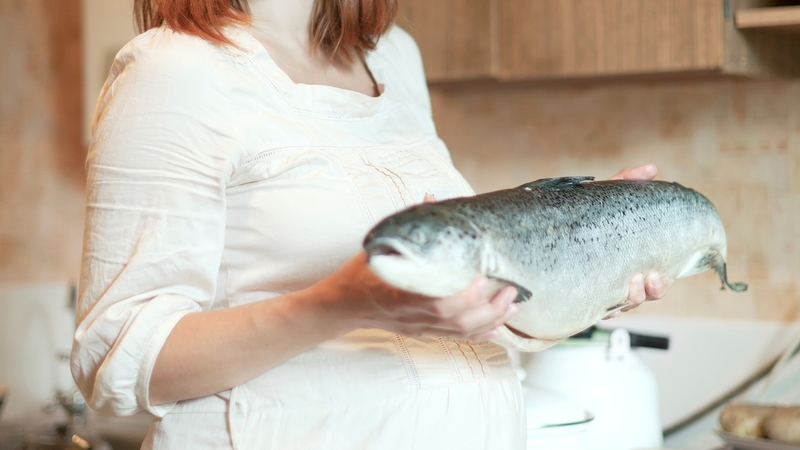 Pregnant women and breastfeeding women may consider fish such as Wild-caught Pacific Sardines, Wild-caught Alaska Salmon and Farmed Arctic Char and others. The key is to consumer a variety of fish – farmed and wild; lower and higher on the food chain, etc. Each of these has pros and cons. Proves to be boon. Never knew boon was a word. Thats scary in this day of the internet. Luckily for both mother and child, the Fukushima radioactive contamination is killing most species of contaminated fish in massive extinctions, reducing the chance of radioactive contamination of the child both inside and outside its mother so we don’t end up with near as many horribly disfigured mutations. Google Chernobyl Children to see the 3rd generation mutations that get worse and DNA never recovers after a disaster seeps into their lives. America seems unable to help itself feeding contaminated seafood to its children to protect its seafood industry…..dammit. I don’t much trust the wisdom of nutritionists and scientists either, but I have more trust in such widely held, long-practiced folk wisdom. You don’t go hauling stuff hundreds of miles p steep mountains fornothing. But, alas, that was long, long before we used the Pacific as the world’s nuclear trashcan. EXPECTANT MOTHERS, DO NOT rush out to buy fish. Wait a month of two and another article will come out that fish is bad for both you and your baby. What a bunch of idiots (nutritionists/scientists) we have in this world who can’t agree upon safe and healthy nutritional diet for the human race. Quite true & chief among the (well documented) warnings against consumption of upper-food-chain fish…tuna, swordfish etc , are known (as fact) to contain dangerously high levels of mercury (a highly toxic substance) & other heavy metals…see; ‘Minimata Disease’ for reference. Since 2011, mercury must take a back seat to contamination of Cesium 134 and 137, Plutonium, Americium and Uranium from the 3 melted down reactors at Fukushima Daiichi NPP in Japan. It dumps about 400 TONS of horribly contaminated radioactive water full of thousands of radionucleids into the Pacific Ocean ever 24 hours and now has permission from the Jap government to dump all those huge tanks of nuclear waste into the ocean at any time. The Canadian divers at Nuclear Proctologist have videos of what used to be fertile kelp forests loaded with life that are now extinct along the Canadian coast from it. TV, controlled by the nuclear corporations, says nothing of the contamination, nor does the controlled governments.